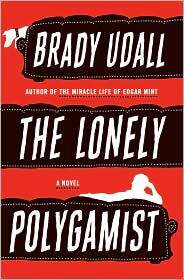 When it comes to families, I think that Tolstoy (in Anna Karenina) said it best: “Happy families are all alike; every unhappy family is unhappy in its own way.” And I think Brady Udall had this in mind when he wrote his newest novel, The Lonely Polygamist, because the Richards’ family is anything but run-of-the-mill unhappy. Of course (and here's where my monogamist upbringing does me a disservice) the Richards’ family, with its four wives and twenty-eight children (there's a family tree/breakdown in the book's opening pages), could be entirely run-of-the-mill. But Udall's telling of their unhappiness makes this an enjoyably unique experience. The books narration is centered around three members of the Richards’ family: Golden, the father; Trish, the fourth and youngest wife; and Rusty, the fifth son, age eleven, and “the family terrorist.” Their stories are interspersed with intercalary chapters about the family as a whole (the aforementioned family tree will come in handy, as no names are given in the intercalary chapters). Golden is a construction contractor whose failing business is currently working on a Nevada whorehouse. Golden is a gentle giant with no real power over his family or his construction crew. While in Nevada he begins an innocent (at first) affair with an unlikely candidate. This shakes up his already unstable relationship with all four wives. Trish is twenty-seven, and is twenty-one years younger than Golden's first wife. She craves attention from Golden. She needs his love and support to pull herself out of her depression over a stillborn child (lost less than a year before the book begins), but Golden does not know how to give it. Trish begins to find that love and support in an unlikely candidate. Rusty is misunderstood. The Richards’ family is divided between three households and Rusty is forced to live in a house separate from his biological mother. Rusty is angry and confused. He needs a father figure, but Golden's attention is spread too thin to give anything but negative attention to Rusty. Rusty finds (surprise surprise) a father figure in an unlikely candidate. These three characters, and their needs, desires, and dissatisfactions, are approachable and accessible. I laughed at Golden's tragicomic escapades, but wanted him to figure out how to save his family. I wanted Trish to find the love and support she needed. I wanted the family to understand how special Rusty was, and for someone to answer his desperate cries for attention. And that makes the story of the Richards’ family a pretty familiar one.